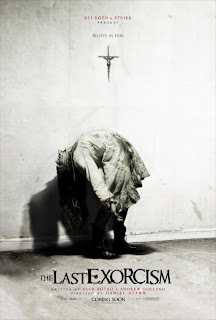 What is interesting about 'The Last Exorcism' is that this movie never truly scares you. Sure, there are moments where you prepare yourself for a good shock, but you are never fulfilled by these expectations. The interesting part is that no matter how many times the movie fails to scare you it is still interesting to watch and you are completely engaged with these characters up until its final moments. A few hours after seeing the film and I admit to still being somewhat confused as to how I really feel about it. I liked parts of it, that's for sure. The first half hour or so is pretty great and you feel like these guys are really onto something here. The character of Cotton Marcus is etched out very well and giving the audience a look into this mans mind only deepens the emotional pull of later events that correlate with the central epiphany of the film. The script offers some nice layers and some pretty creepy moments most of which are carried out by the wonderful Ashley Bell whose performance really makes or breaks the film for the viewer. Sure, Fabian is a perfect mix of arrogance and charm as Cotton and is able to make us understand why he does what he does without coming off a complete a-hole is quite impressive, but for the credibility factor of the film there was always going to have to be someone who could make the possessed girl come to life and rise above the standard cliches of sheltered daughter of an old religious nut. They always seem to fall into that category don't they? Bell plays Nell with such innocence underlined with suspicion you never really trust her. She is sweet and thankful one moment and we want to love her and root for the exorcism to work despite knowing the whole thing is a hoax. And without a moments notice she is crawling around like spider-man with a blade in her hand searching for her next victim and we want someone to get a hold of her and do what has to be done. She contorts and hisses her way into a bad part of our minds and if this movie leaves us with one impression it is how strong of a performance Bell gives on such a thinly written part on the page. As you may have heard, the last five minutes destroys the good momentum 'The Last Exorcism' had in its earlier parts and this is no doubt true. It is as if the writers simply did not know either where to go with the film at a certain point or if they just wanted to end it and this was the quickest way to wrap it up. It is hard to explain really, the film shifts gears so fast we are kind of caught off guard and when exiting the theater catch ourselves thinking, "Is that really all they could come up with?" And so, a few hours after seeing the movie I am still left with the feeling of it could have been better. They had me until the end. The documentary style way this was shot and told works for me still and for such an unknown cast it had a slew of strong performances, now only if the story could have pulled all this together in one of the more satisfying scary movie of the past few years. Oh well, I guess they can say they gave it a good shot, but in the end, we were never really fooled and our worst fears were realized: Just another good idea with nowhere to go.